Simply Me: Hatched with Jeff Foxworthy! Disclaimer: I was given products in this this post for the purpose of review. I was not paid in anyway to write this review. All opinions are my own. Just in time for Easter, HATCHED features the famous voices of Jeff Foxworthy (The Smurfs, The Aviators) and Sean Astin (The Lord of the Rings franchise, “Sofia the First”). 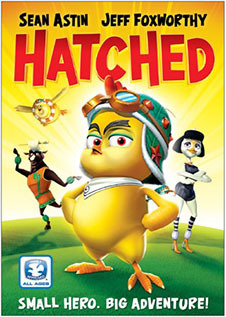 As part of a planned trilogy, the hilarious animated adventure follows Cluck Norris (Astin) and Charlie Horse (Foxworthy), along with Angelina Poultrie, Tiny ScharzHENegger, Meryl Cheep, and their other barnyard friends as they set out on an unexpected cosmic thrill ride!